Dog Food Advisor › Forums › Diet and Health › Elevated Feeders? What is your take on elevated feeders (bowls) for dogs? Good, bad, no difference? I have read articles that support them and some that say they cause bloat. So… What is your take on the subject? I’ve never liked them simply because they aren’t natural. Wild canines don’t build tables to eat their meat or drink their water on. Virtually everything is within a foot or two of the ground. I use an elevated food bowl for one of my dogs. Hannah, my 14.5 year old Maltese, has 2 degenerated discs mid spine so elevating her food and water bowls makes it a little easier on her back. Shasta: I know that dogs in the wild do not eat on tables but if you have a companion animal that has medical issues the kindest thing as their guardians is to make life a little easier on them if you can. Making their life as pain free as possible is part of our responsibility. I’ve never had large dogs but I have known people with large dogs and they say it helps their dogs with the issue of bloat. There is no way to know if dogs die in the wild from bloat because there is no one there to help them. But we are here to help our companion animals. We use one for our bloodhound, even though the experts are pretty much split on whether it does/doesn’t help/cause bloat. We also take other precautions (she doesn’t get to go out an hour before/after feedings, she eats multiple smaller meals a day, we limit the amount of water she drinks at once, etc). I think it genuinely just depends on whether or not *you* yourself want to use one. Very interesting! Thanks, Dori, Mo’s Mom, and Carlyn! I think I will look for a metal elevated stand to put Bruno’s new bowls in. I want to see if the elevation will make any difference for him, I guess with the burping after eating. Like I said, he doesn’t gulp (he chews his kibbles), but he eats fast and sounds like he’s about to throw up when he’s done, but it’s always just a loud burp, lol. This reply was modified 4 years, 12 months ago by Naturella. So, what is you all’s take on material of bowls? Ceramic, stainless steel, or plastic? So far Bruno had stainless steel ones, and now we’re using these ceramic glazed ones, so basically the cover is glass. So… What is the best? Stainless steel are suppost to be best, sturdy, long lasting & dish washer safe. Ceramic bowls are dish washer safe & can use boiling water to kill germs but they can crack & break & have micro cracks that can be a breeding ground for bacteria, Plastic bowls some dog & cats can be allergic to, dogs can chew their bowls, the plastic scratches & even with regular washing they can breed bacteria…I just human ceramic bowls for Patch, if I see any cracks I throw away. Stainless are supposed to be best, but there was recently a recall on stainless bowls that were made with some radioactive metal, from China no less. Ceramic is next, but if the glaze becomes cracked, it can hold germs. Last, is plastic. It can cause a sensitivity reaction that causes the nose to lose pigment and it scratches relatively easily and those scratches can hold germs. I don’t much worry about germs with my dogs, but I’m not risking my dogs nose pigment. I love those bowls! Your hubby is very artistic. Stainless steel bowls are the best. Basispet.com makes and sells bowls that are made in the USA out of USA stainless steel. Most stainless steel bowls sold at the large pet stores are made from stainless steel material containing lead. Huge recall last year or year before. Ceramic and clay pots can develop hair line cracks that will breed bacteria. The cracks can be so minute that they are almost invisible to the naked eye. The stainless steel bowls that I use are from basispet.com I think I learned about them from Shawna. This reply was modified 4 years, 12 months ago by Dori. Sue, Patty, and Dori – thanks so much for the input – I think we will be using hubby-made bowls from now on – he is a ceramist (the “real”, a.k.a. fancy name for potter), and he is learning his clay pretty well, so yeah, we know to beware of cracks and burst bubbles on the bowls. But other than that, I love them! And those were his first try! We may try to start selling some at local markets/stores eventually! I love the ones from Basis Pet! Hi all! I have tons of dog bowls. While I think stainless is probably one of the best to use, I have the Basis bowls, I also love Fiesta Ware’s glass pet bowls. They’re stylish and made in the USA, as well. I also have ceramic bowls from a woman that makes hand made pottery wheel bowls especially for spaniels with their long ears in mind. They are very nice. Some of the best bowls you can buy are just human pyrex or anchor hocking clear glass bowls in the kitchen supply area of the store. They are made in America, and are sturdy. I have stands for some of the bowls. When Stella was living I found that she ate better out of a bowl that was either in a stand or had a built-in stand. I have some awesome bowls from Bauer pottery that are “high” with a wider base that fit the bill for Stella….later I discovered she had SM (syringomyelia – sic, a neurological disease which has now become common in Cavs) so that is why a higher bowls worked better for her. I also found some Mason Cash bowls at TJ Maxx that were really cheap and are awesome for spaniel’s water bowls. This reply was modified 4 years, 12 months ago by Mom2Cavs. Yep, I did check them out Jan, they’re on my “someday” list! My mini poodle was scared of his dog dish (his ID tags would hit it and make noise when he ate). So I put his bowl up on an overturned orange crate so the angle would be different. I’ve done this for a month or so. And now that I think about it, he IS burping less frequently. It seems harmless enough to me! Hi Jan. Are you talking about the bamboo stands from Basis? I was hoping someone else might have purchased and get their opinion. No one has mentioned having them yet. I was wondering how they would hold up to daily use and how well they clean up. Do you recall where you bought the Fiestaware glass pet bowls? I’ve looked on line for them but can’t find them. How do the Bauer pottery bowls hold up? Hi, dchassettt, yes there are the bamboo coaster stands, but I just ordered the other new stands, they seem to be made out of the same material as cutting boards. I’ll let you know how they are when they come. They don’t put much height, if at all, to the bowls though. I wanted them to keep the bowls in place. 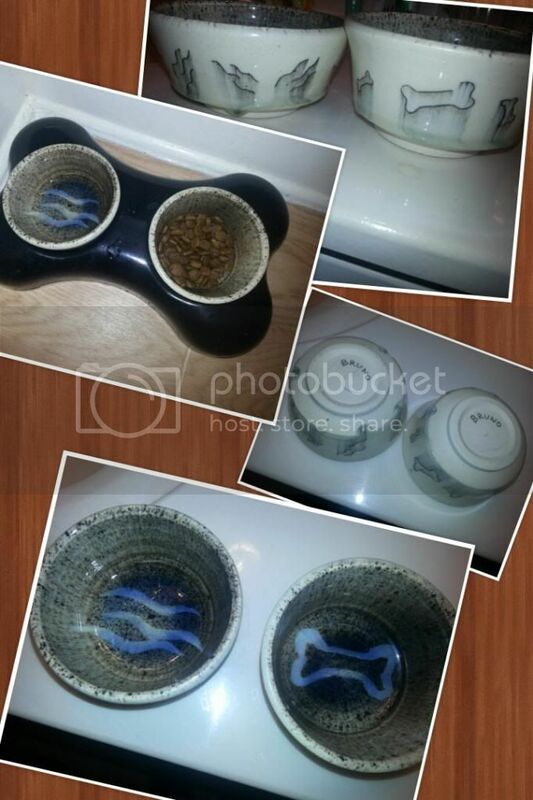 I don’t remember where I bought the Fiesta ware pet bowls….google it and a few sites come up. Maybe Wag.com? The Bauer bowls are awesome and a good heavy weight. Hope this helps. Hi! I wanted to comment since I have a giant dog and use an elevated feeder. I have been using an elevated feeder for Max since I brought him home. He is 36″ tall at the shoulder and his bowl is held at 24″. It is at a height where he can comfortably eat. I don’t know whether an elevated feeder prevents or causes bloat but I can tell you that Max has never had an issue with bloat in the 6 years that I have had him and fed him from an elevated feeder. I can’t imagine feeding a Great Dane on the floor. In my personal opinion, elevated feeders are important for taller dogs to eat comfortably.